NATS carries a complete line of medical supplies that you'll use on a daily basis in your shop. We carry everything you need for day to day operations including ink cups, squeeze bottles and more. Disposable ink cups are available in seven different sizes, ranging from 9 mm to 30 mm, and are packaged in cello bags of 1000 units each; the 30 mm extra-large cups are packaged in bags of 100. Clip cord covers are available in two different widths, and our convenient and durable disposable aprons, in bags of 100, are lightweight, durable, disposable, and eliminate cross-contamination. 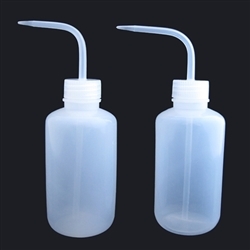 Squeeze, ink, and spray bottles are offered in varying sizes, and of course we have safe and secure sharps disposal containers. Disposable twin blade stainless steel razors are perfect for removing hair to eliminate cross-contamination and have skin-softening grips.